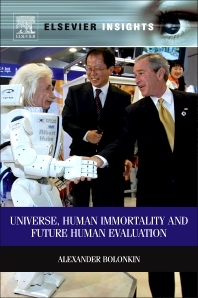 This book debates the universe, the development of new technologies in the 21st century and the future of the human race. Dr Bolonkin shows that a human soul is only the information in a person’s head. He offers a new unique method for re-writing the main brain information in chips without any damage to the human brain. 5. What Is the Human Soul? 6. What Is “I”? What Are “We”? 8.5. What Can We Do? 8.6. Must We Fear the Electronic Civilization? 8.8. What Will Happen with Humanity? 10. What are Science, Soul, Paradise, and Artificial Intelligence? 11.3. What Are Men and Intelligent Beings? 12.3. What Is Alive and What Is Imbued with Reason (Intellect)? 12.9. What Can We Expect from Other, Alien Civilizations? 15.1. What Is an Intelligent Person? 16.2. What Is Homo sapiens? 16.4. What Is a Person (an Intelligent Being)? 16.5. What Is Reasonable Intellectual Man or Person? 16.6. What Is a Free Man (Person) or E-being and What Is a Manipulatee? 16.7. What Are God and Supreme Mind? 16.8. How to Become Immortal? NASA, Labs of the US Air Force, NYU, NJIT, C&R, MAI.